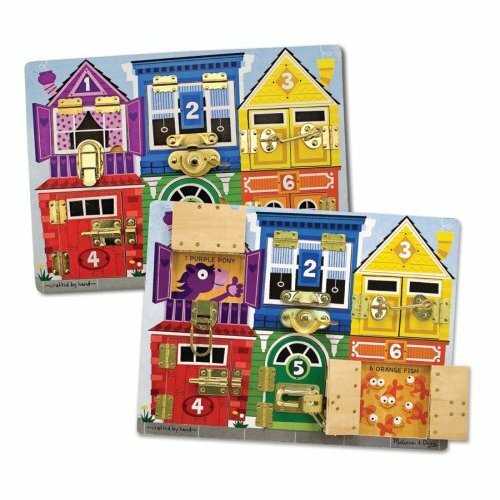 We have recently received the Melissa and Doug deluxe latches board as a gift and it is an excellent toy. We have several wooden puzzles and this one seems to hold greatest interest for my 14 month old son. I must mention that he loves locks, keys and any little metal thing that he can fiddle with. The toy is educational; kids will learn colors, numbers, and various animals. They will also work on their fine and gross motor skills while learning how to open and close six types of different latches. The board also functions as a good memory game: we ask my son to show us which house the dogs live in, or the fish… The toy says it is for ages 3 and up, but my 14 month old loves it and so I highly recommend it!